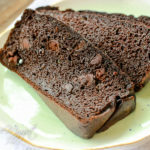 If you are gluten free and are missing Pumpernickel Rye Bread, then this recipe is for you! 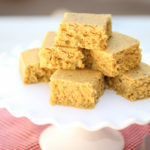 It is moist, savory, soft & spongy. 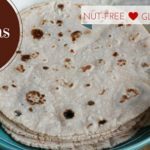 It is the perfect gluten free bread recipe to serve with soup, a sandwich or salad. 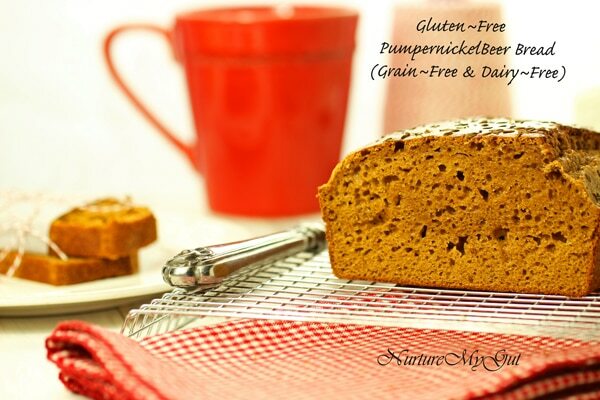 This recipe has been adapted from Living Without’s June/July 2014 issue of their Gluten Free Pumpernickel Beer Bread. It was such an intriguing recipe. 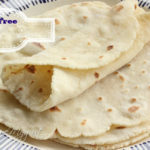 I tested the recipe first with a dairy free flour blend and the texture was too crumbly, the bread did not hold together well. I did not follow the original recipe, my creativity and curiosity always leads me to taste and modify an original recipe as I bake. 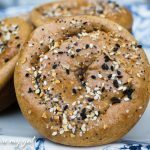 My intuition told me this bread would be wonderful with grain free flours. I still used yeast so it would be soft and have a nice rise. 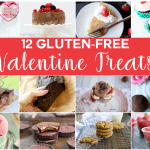 It is actually my first time using yeast in grain free baking. I love the results!!! 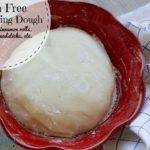 I keep killing my gluten free sourdough starter so now I use yeast for homemade gluten free breads and pizza. Also, I love the fact that almond flour is low glycemic, high in protein and for me, it’s easier to digest. 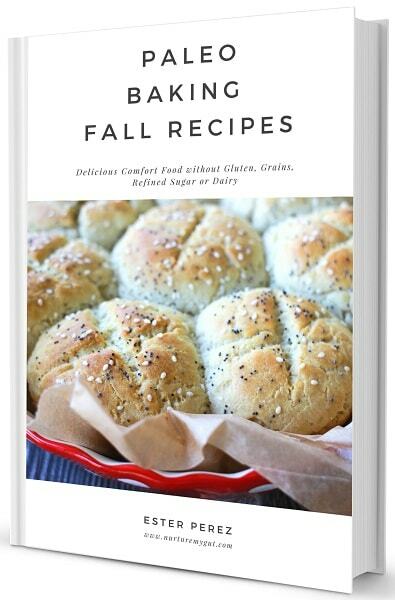 Although I have expanded my diet thanks to Essential Oils, I prefer the taste, texture and ease of digestion of grain free baking! This bread turned out amazing and it took me only two trial runs! I made it for a friend and her son who are recovering from surgery and a broken arm. I served the bread with a black bean butternut squash soup. It was the perfect combination. They said they could not stop talking about the soup and bread and requested recipes ASAP!! 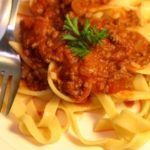 Kay and Max, this recipe is for you!!! I am glad the food got your minds off what you are going through even if it was just for a little while! 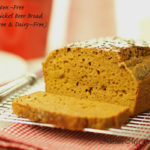 This gluten free Pumpernickel Beer Bread is made with, well…beer. I must add this is the first time I have ever cooked with beer, I don’t even drink beer, but I will admit that I love the tangy flavor it gives the bread. 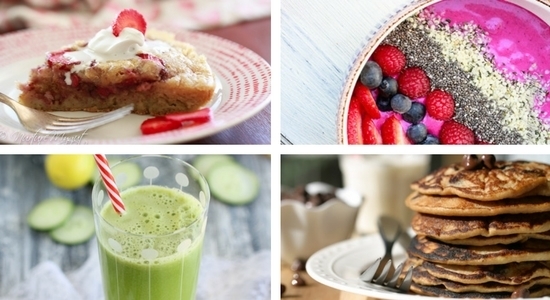 I added orange juice and honey to this recipe and it really balances the flavors. 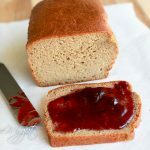 Although there are several ingredients in this gluten free bread, the ingredients really come together and are worth all the work it takes to make this bread. 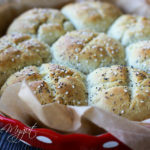 This will be one of my favorite breads and I will be sharing this with friends on special occasions. 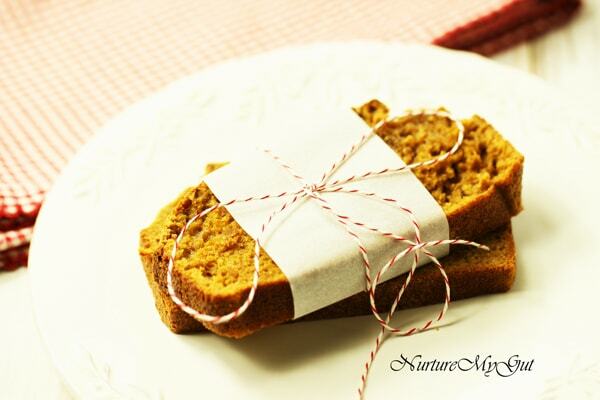 I think I may even try several variations, I see Pumpkin Bread coming soon!!!! Ps. 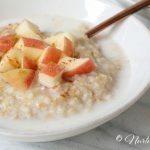 Be sure to pack this for a sick friend, it is guaranteed to make them feel happy thoughts!! 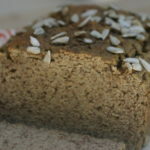 Gluten Free Pumpernickel Beer Bread. It is moist, savory, soft & spongy. 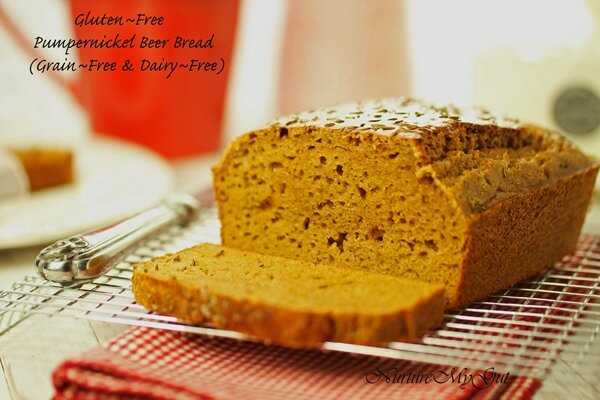 It is the perfect gluten free bread recipe to serve with soup, a sandwich or salad. In a large mixing bowl, add blanched almond flour, tapioca starch, cocoa powder, salt, yeast and orange zest. 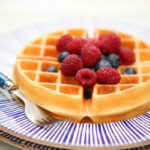 Whisk together well to remove all lumps from almond flour. Set aside. In a separate mixing bowl, add warm water and honey and whisk to incorporate honey into water. Add eggs to honey mixture and beat. Add orange juice, molasses, apple cider vinegar and beer. Whisk all ingredients until well incorporated. Make a well in the center of dry ingredients and slowly incorporate wet ingredients into dry by whisking from the center out. Whisk until well incorporated. Mixture will be the consistency of wet cake batter. Grease or spray a regular sized loaf pan and pour batter into pan. 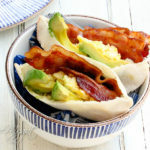 Allow to rise in a warm location for 35-45 minutes. 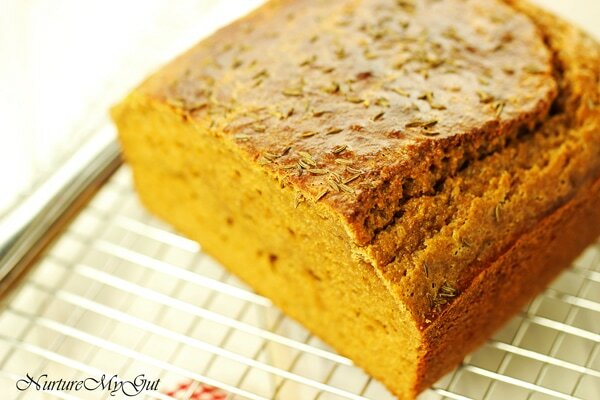 Sprinkle the top with a pinch of caraway seeds before baking. Bake bread in the center rack at 375 degrees for 30-35 minutes or until the center of the bread springs back.